It is estimated that about 10 million people present to the emergency department in the US each year with complaints of chest pain. Of these about 6 million people are admitted for workup of AMI and 1.5 million people rule in as having an AMI. Unfortunately about 11,000 of the remaining patients are discharged with an undiagnosed AMI [1, 2] . A variety of proteins are used to detect myocardial damage. The choice of which cardiac markers to analyze, depends on the time elapsed since the suspected beginning of the infarction, which is usually taken as the time of the onset of chest pain or discomfort. Diagnostic problems arise because many of these substances circulate in the blood, albeit at lower levels, in health. 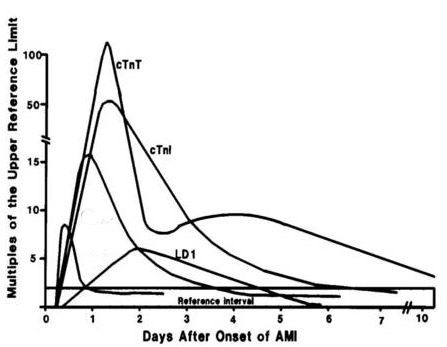 The diagnosis of AMI relies heavily on the analysis of troponins. Of the markers currently available, cTnI and cTnT offer the highest degree of cardiac specificity. Troponin is a regulatory protein complex located on the thin filament of the contractile apparatus and consists of 3 protein subunits: troponin T, troponin I and troponin C which act to regulate muscle contraction. 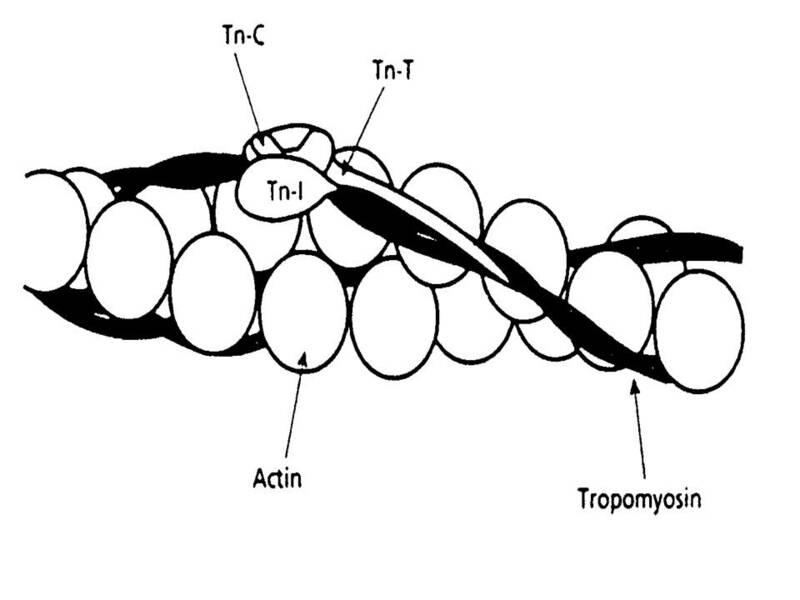 Troponin T binds to tropomyosin, Troponin I inhibits myosin ATPase, and Troponin C binds to calcium. Unlike other cardiac markers that are used to detect cardiac damage, cTnI and cTnT have different isoenzymes from those found in skeletal muscle, and thus they are specific for cardiac injury. In addition to detecting an AMI, elevations of either cTnT or cTnI have prognostic value. Marginally elevated concentrations of cTnT and/or cTnI are associated with future adverse cardiac events. It is important to realize that currently there are many different cTnI assays and reference ranges vary widely depending on who manufactures the assay. At the VA hospital cTnI values between 0.07 and 0.20 ng/mL suggest myocardial ischemia or early infarction serial testing is indicated. Values greater than 0.2 ng/mL are consistent with MI, indicating the patient should undergo serial testing. Reference range: < 0.07 ng/mL. Since there is only one assay available for cTnT, the reference ranges have less variability between laboratories. Serum cardiac troponin T > 0.1 ng/mL suggests myocardial damage, an MI, or high risk for future myocardial events. Many end-stage renal failure patients on hemodialysis (60%) have elevated cTnT and/or CTnI, which does not represent an AMI, but is associated with future adverse cardiac events. The percentage of end stage renal failure patients on dialysis that are cTnI positive is less than that observed with cTnT. Elevations of cardiac troponins are diagnostic of heart tissue injury but do not always indicate myocardial infarction. In the setting of ischemic symptoms a rise and fall indicated myocardial infarction, but elevations can be caused by other factors such as heart failure, drug toxicity, myocarditis, etc.). CK (molecular weight 86 kilodaltons (KD)) is an enzyme responsible for the conversion of creatine into phosphocreatine, the energy source for muscle contraction. Since CK is found in all muscle tissue, elevations of the total activity of this enzyme are not specific for cardiac damage. However, CK is a dimer and there are three different forms of the enzyme (isoenzymes) with varied tissue distribution. In skeletal muscle the predominate form of CK is CKMM. 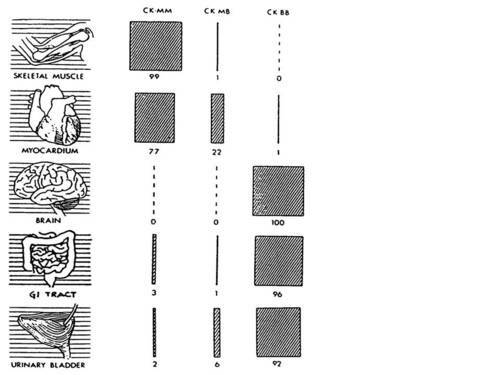 In heart muscle CKMM is also the predominate form, but CKMB makes up about 20% of the CK activity, whereas in skeletal muscle CKMB is generally about 1% of the CK activity. The third form of CK, which is not used as a cardiac marker, is CKBB. Since cardiac tissue has the highest percentage of CKMB isoenzyme (22% CKMB and 77% CKMM), this isoenzyme is monitored in the diagnosis of AMI. The key finding in myocardial infarction is an elevation of CKMB to greater than 10 ng/mL, approximately 6-48 h after the onset of chest pain. It is important to remember that CKMB is not cardiac specific, as about 1% of the CK found in skeletal muscle tissue is CKMB. 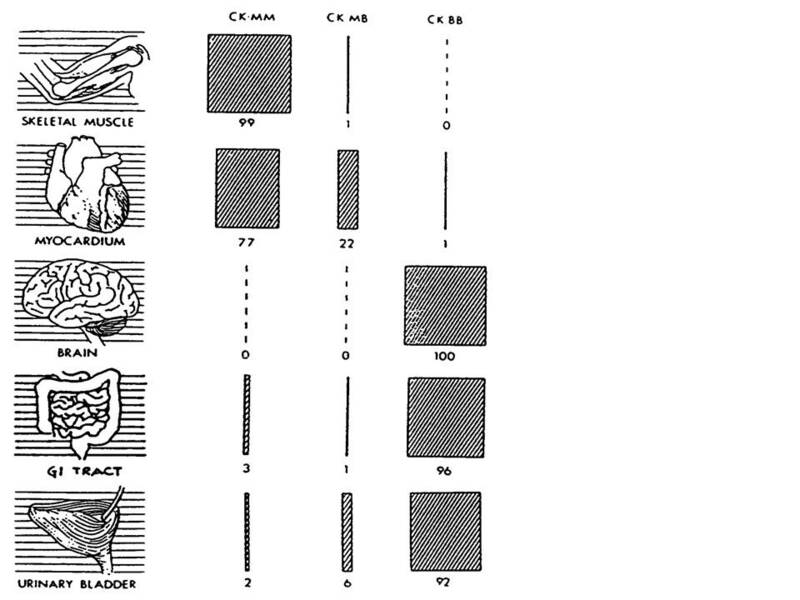 The tissue distribution of CK is shown on the figure on the next page (Figure 4). The lack of specificity of CKMB for cardiac tissue has led the use of the CK index (“relative index"). In these cases the use of the CK index helps distinguish between cardiac and non-cardiac causes of elevated CKMB. It is advisable that during the first 24 hours at least three samples be drawn for in order to pinpoint the peak of the elevation of CKMB. Demonstration of the peak (rise and fall) within 48 hours increases the specificity of the test since it occurs in MI but not in muscle disease in which values plateau. An elevation of CKMB above 10 ng/mL with an elevated CK index indicates myocardial infarction with very high specificity. Myoglobin is a low-molecular weight protein (about 18 KD) found in all skeletal and cardiac muscle and is involved in oxygen binding. Due to its small size, it appears in serum rapidly after release from injured muscle and is cleared into the urine. Since myoglobin is found in most tissues, it has the least specificity of any of the cardiac markers. False positive results for diagnosis of myocardial infarction may be encountered with skeletal muscle injury and renal failure. Serum myoglobin > 70 ng/mL is an early, but not specific indicator of myocardial infarction and thus should never be used by itself. For patients who arrive within several hours of onset of chest pain, myoglobin is analyzed on admission and 90 minutes later. If the concentration has increased by at least 25%, this is consistent with an early MI. This finding should be confirmed with more specific techniques (cTnI, cTnT, or CKMB). An estimated 4.8 million Americans have CHF with an additional 550,000 new cases each year. Of the CHF patients, about 300,000 patients will die each year  . Symptoms of CHF are often nonspecific (dyspnea) and consequently this syndrome is sometimes difficult to diagnose. Analysis of B-type natriuretic peptides (BNP) have been approved as diagnostic markers for CHF. BNP is synthesized as a pro-molecule consisting of 108 amino acids, pro-BNP (1-108). With left ventricular dysfunction (volume overload and myocardial stretch) pro-BNP (1-108) is released from the left ventricle. During this process pro-BNP (1-108) is cleaved into the active hormone BNP (77-108) and an inactive N-terminal fragment known as NT-pro-BNP (1-76). Assays with antibodies that recognize to the carboxy-terminal of the molecule, BNP (77-108), or the amino-terminal, NT-pro-BNP are used to diagnose and monitor treatment of CHF. Both NT-pro-BNP and BNP concentrations have been shown to correlate with the degree of cardiac failure, but these assays have different reference ranges. Thus it is important to know which type of analysis is being performed on your patients. A 29-year-old woman was prescribed penicillin V for pharyngitis by her primary care provider 2 days before ED presentation. On that same day she took 1 dose in the afternoon and a 2nd dose between 6 and 8 p.m. that night. She presented to the ED at approximately 1:45 am complaining of lip swelling and shortness of breath. Lip swelling commenced approximately 10 hours after the initial dose. She denied chest pain or pressure, dyspnea on exertion, and cough or sputum production. Physical exam revealed an anxious young woman in moderate respiratory distress. Initial vital signs were: temperature 36.7°C, blood pressure 113/64 mmHg, pulse 73 beats/min, respiratory rate 28, O2 sat 94% on room air. Immediate medical treatment included diphenhydramine 50 mg IV, methylprednisolone 125 mg IV, and cimetidine 300 mg IV. As she continued to be tachypneic and distressed, she was given 1:10 000 epinephrine, 0.1 mg (1 cc) IV. The dose was confirmed, as it was a preloaded 10-cc syringe. She began to complain of severe pressure-type central chest pain. Results of an ECG revealed ST elevations in several leads. Calculate the relative index for the three time points. Based on these laboratory findings did the patient rule in for an MI? How do you explain the normal values of CK and CKMB? Is this a common ADR for epinephrine? A 57-year-old man presented to the emergency department with a 1-hour history of shortness of breath, coughing, and “chest tightness.” He states that his symptoms appeared suddenly while he was watching television on his couch. He describes a constant “squeezing” sensation in his chest limited to the parasternal region associated with a paroxysmal nonproductive cough. He describes his shortness of breath as “difficulty getting air,” denying any pain on inspiration or expiration. He denies any similar episode in the past. His past medical history is significant for diabetes mellitus, hypertension, and severe peripheral vascular disease. In the past 6 years his right leg was amputated just above the knee and the left leg below the knee. He denies any syncopal episode, thigh, or abdominal swelling. He sleeps on one pillow at night and usually does not wake up to urinate. He used to drink alcohol heavily but has not had a drink since 1978. He denies any tobacco or illicit drug use. How do you interpret these data? Are they diagnostic? Given the above results, graph their relative crescendos, peaks, and durations of elevation. What do the lab tests tell you about the chronology of events? Why might the patient not have presented with typical chest pain? A 34-year-old woman presented with squeezing substernal chest pain radiating across her chest and down both arms, diaphoresis, palpitations, light-headedness, and shortness of breath for 3 h. She did not smoke cigarettes or use recreational drugs, and had no history of hypertension, hypercholesterolemia, diabetes mellitus, or family history of cardiac disease. EKG changes showed 0.5 to 1.0 mm ST changes. Vital signs: blood pressure 159/97 mmHg, heart rate 52 beats/min, respiratory rate 16 breaths/min, room air oxygen saturation 100%, and oral temperature 37.0°C. Cardiac examination revealed a regular rate and rhythm with I/VI systolic flow murmur. Lung, extremity, skin, peripheral pulse, and neurologic examinations were normal. Calculate relative index for the 6 hour, 12 hour, 24 hour time points. Based on these findings discuss whether or not this patient ruled in for MI. What other lab tests would have been useful to diagnose cardiac damage? i have pain my left arm i meet doctor end make 2 ECG end Exry end one blood test. Is it normal to have a troponin of 1336 negative?